“If you follow an artist purely based on looks, then shame on you; but if looks are what you would call a nice bonus added to already talented musicians, then I would suggest checking out Hunter Tynan Davis. Sporting a country-Adam Levine sort of style with a half-buttoned shirt and blue jeans, Davis jumped up on stage looking like the ever-ready rock star. He started off the night with a few solo songs on his electric guitar, which was a nice change after the acoustic sets. The lyrics to his songs are uncomplicated and simple but are riddled with deeper meanings and relatable content. And while his solo set was charming, it didn’t grab the attention of the crowd like I wish it had. Davis then made a decision that completely changed the direction of his show: he invited a backup band onstage. Suddenly it was like the world had turned on its axis and everyone was moving along (whether subconsciously or not) to the bluesy rock music. Davis’s grinding voice mixed with the detailed musical nuances one doesn’t normally hear in live music was intoxicating. Despite there being no spotlight on Davis, he didn’t have trouble catching the audience’s eye: his raw energy while playing and singing was electric. Whether it was a hard blues/rock song or a slow jazzy number, Davis seemed to take on the role of rock star like he was born into it. Not one to take life too seriously, though, Davis displayed a joking manner just like the artists before him. When a crowd member demanded that he unbutton another button on his shirt, his pianist promptly did so for him, tearing at his shirt until it was open down almost to his belly button. Davis shrugged, smiled, and acted like he was bringing the low-cut shirts – made so popular by Led Zeppelin in the 70’s -back in style. Born on the Gulf of Mexico, Hunter Tynan Davis literally spent his formative years gaining his “balance” on the bow of his grandfather’s shrimp boat. Every day was in pursuit of the rising sun and a race to catch it before it sank into the ocean. 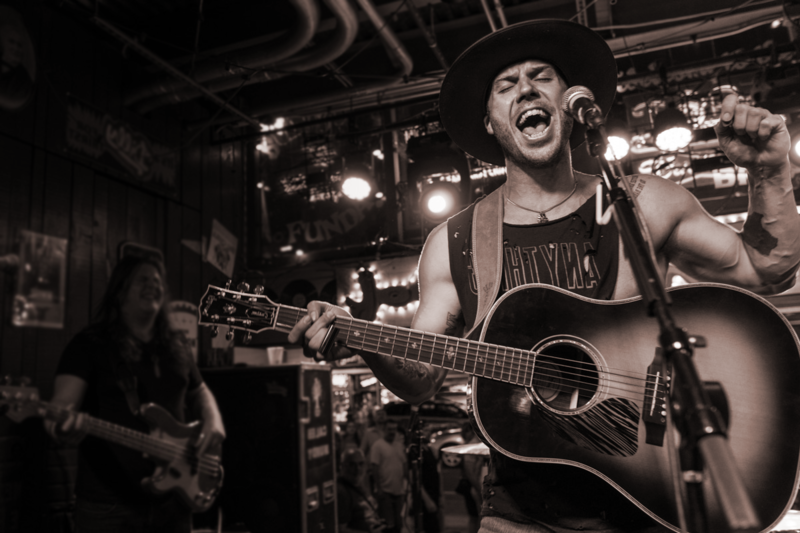 Hunter is the sixth generation of his family raised on the coastal plains of southeast Texas where the cultural and musical influences are more Cajun than cowboy, more cattail than cactus, and more alligator than armadillo. You can hear the sounds from the shallow backwaters and taste the thick salt air in his music. A natural osmosis infused his soul and flavored his aggressive, back-beat finger picking guitar style and songwriting. At the age of eleven Hunter began (as many songwriters do) playing on his father’s old Spanish guitar and the musical whirl winds were set in motion. As the years progressed, Hunter’s playing and songwriting abilities grew exponentially along with his love of sports. After a brief stint playing division one college football, the path of life was made clear…music. Hunter enrolled in a music school nestled within the confines of Port Arthur, Texas home to Janis Joplin, Johnny and Edgar Winter, Gatemouth Brown, Tracy Byrd, Mark Chestnutt, and the Big Bopper and began the great endeavor of being a full time student and travelling song-writer. Throughout this time period Hunter traveled the country and opened up for acts such as Aretha Franklin and Johnny Preston…he also somehow managed to graduate. After graduation Hunter made his move to Nashville, Tennessee. If y’all have any questions, feel free to shoot me an email.